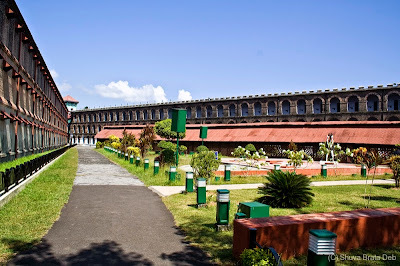 The "Cellular Jail"(1896–1906) at Port Blair, Andaman & Nicobar Islands, India built in the year 1906 during the British Raj was meant to serve as a tough prison for the Indian activists who actively took part in India's freedom struggles. However, the British had been using the Andaman islands as a prison since end of Sepoy Mutiny of 1857, the worst rebellion in the entire history of the British empire. It is a maximum security prison, almost as notorious as once a top-notch security prison, but now an abandoned prison "the Alcatraz Federal Penitentiary" of the USA on Alcatraz Island, 1.25 miles (2.01 km) off the coast of San Francisco, California, which operated from 1934 to 1963. Roughly the modern day equivalent of now famous the ''Guantanamo Bay military prison'' located within Guantanamo Bay US Naval Base, which fronts on Guantanamo Bay in Cuba. 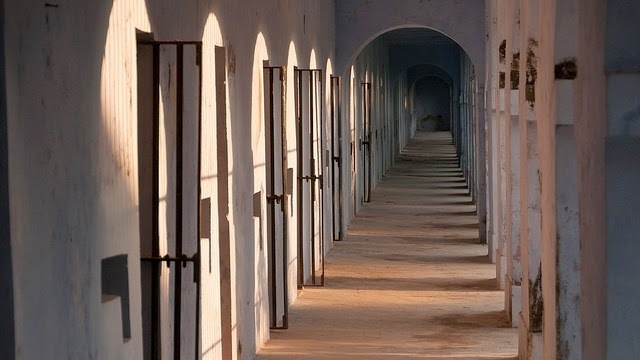 It was also known as Kala Pani, meaning 'Black water', the term that is used for deep dark blue sea and exile.The islands formed an ideal prison venue because of their isolation from the main land and lack of contact between the prisoners and their family. Solitary confinement, stiffening and damp nature of the cell floor, barbaric punishments, verbal abuses, etc will break the spirit of tough men and induce desolation, hopelessness and loss of faith. The prisoners, with neck-ring shackles and iron fetters (in chain gangs), were forced to build prison buildings and harbor facilities, etc on rationed food. As a result of extreme hard labor in the tropical climate many died and the British had least remorse and sympathy for the prisoners. By the late nineteenth century, additional prison buildings were added to accommodate more prisoners. The early central buildings were made of bricks specially brought from Burma (Now Myanmar). This is a seven wing prison building, with a central main watch tower. Each wing had three stories, with a total number of cells being 698 each measuring 4.5 m x 2.7 m in size with a small ventilator situated at a height of 3 m, the wings radiating from the central tower in straight lines, more or like a bicycle wheel's spokes. Interaction between the inmates was impossible and solitary in nature. Most of the inmates were staunch Indian freedom fighters and some criminals. Soon after the Sepoy rebellion was suppressed (1857), the British executed numerous rebels and tortured scores of rebels mercilessly to avoid committing serious offenses in the near future. Paradoxically, during the World War II when the Japanese invaded the islands in 1942 and under their temporary occupation this cellular jail, which housed the prisoners of British India, became a penitentiary for the British officers and soldiers themselves as well who were caught by the Japanese army. In 1945 the British reoccupied the Prison. Innumerable freedom fighters underwent severe and inhuman punishment here and several of them were put to death. Many wings were demolished during the war time. A hospital was started in 1963 in the name of Govind Vallabah Pant, who himself was a great patriot and selfless freedom fighter seriously injured and permanently impaired by the British brutality.